At least 13 special routes of U.S. Route 11 and at least one of U.S. Route 11E have existed. U.S. Route 11 Bypass (US 11 Byp.) is a 3.7-mile-long (6.0 km) bypass route around downtown Cleveland, Tennessee for U.S. Route 11. It is a four-lane divided highway its entire length, and it is known as Keith Street. US 11 Byp. begins at an intersection with US 11/US 64 (SR 2, South Lee Highway) in Cleveland near Bradley Central High School. SR 2 turns north onto US 11 Byp., and runs as a hidden route. US 11/US 64 turns northeast into downtown as 3rd Street. At its terminus, it begins following immediately along South Mouse Creek. About one-third mile (540 m) later, the bypass intersects SR 312 (Harrison Pike/Inman Street), a connector to and formerly the route of US 64 about one-half mile (800 m) west of downtown. At this intersection the Cleveland/Bradley County Greenway also begins, following alongside Mouse Creek. The route continues north through a historic residential district. Further along, US 11 Byp. comes to an intersection with SR 60 (25th Street). The route then enters a primarily commercial district, passing the corporate headquarters of the Life Care Centers of America, and turns northeast, crossing Mouse Creek and the Greenway. The route crosses Mouse Creek ridge, passing through commercial area, coming to an intersection with Woodcrest Avenue/Ocoee Crossing, a connector to US 11 (Ocoee Street). About one-half mile (800 m) later the bypass comes to an end at an intersection with US 11 (Ocoee Street). Built as a bypass to relieve downtown Cleveland from industrial and commercial traffic, Keith Street was the first bypass and four lane highway in Bradley County. The project began in 1956, with construction near downtown Cleveland. The section between 17th Street was constructed between late 1959 and late 1960. Initially known as the Cleveland Bypass, Keith Street was named in honor of prominent local resident Keith Hines. Originally, the route's state designation was the State Route 2 Bypass, and SR 2 remained on the bypassed portion of US 11. In 1982, when TDOT modified their highway numbering system, SR 2 was rerouted onto Keith Street. The section of US 11 between the southern terminus of Keith Street and the intersection with US 64 became part of SR 40 (which continues on US 64 into North Carolina, and the section between US 64 and Keith Street's northern terminus became part of SR 74. The entire route is in Cleveland, Bradley County. Business U.S. Highway 11 (Bus. US 11) is a business route of U.S. Highway 11 (US 11) in downtown Cleveland, Tennessee. It runs along U.S. Route 64 and Tennessee State Route 74.
Business U.S. Highway 11 (Bus. US 11) is a business route of U.S. Highway 11 (US 11) that runs from Riceville to Athens, Tennessee. It runs along Tennessee State Route 39 in Riceville until it reaches downtown Athens where it becomes a one way pair just before the intersection with Woodman Street. From there, US BUS 11/TN 39 runs north and eastbound on Madison Avenue, while the southbound routes runs along Washington Street. At the McMinn County Courthouse the routes turn onto a second one way pair specifically northbound along Jackson Street and southbound along White Street. The one way pair ends as the routes merge into Jackson Street at the Tennessee Wesleyan University between College Street and Coach Farmer Drive. On the verge of departing downtown, the road has one major intersection with Tennessee State Route 30 (Decatur Pike westbound and Green Street eastbound), then runs along the hills of the suburbanized landscape of the outskirts of the city. At an abandoned factory near a railroad line, Jackson Street ends as it makes a sharp turn west onto Redfern Drive, then crosses a railroad crossing before finally terminating at US 11. U.S. Route 11 Truck (US 11 Truck), which shares a complete concurrency with US 19 Truck, provides a bypass route for truckers avoiding the residential area of Euclid Avenue. U.S. Route 11 Alternate (US 11 Alternate) is an 8-mile-long (13 km) alternate route in Salem and Roanoke, Virginia. It is concurrent with US 460 Alternate in Salem and US 460 in Roanoke for its entire length. Business U.S. Highway 11 (Bus. US 11) is a business route of U.S. Highway 11 (US 11) in Lexington, Virginia that is 2.2 miles (3.5 km) long. It starts at an intersection with US 11 and Virginia State Route 251 outside of Lexington and heads towards the center of town. In the center of town, it intersects U.S. Highway 60 and keeps heading through town. It then ends at an intersection with US 11. In 1982, the section of Bus. US 11 between Jefferson and White Streets was changed to be one-way northbound, and southbound Bus. US 11 was rerouted along Jefferson and White Streets. U.S. Route 11 Business (11 Bus) is a business route spur of Rt 11 in Staunton, Virginia. It is not a common VDOT road, because it only runs from Rt 262/Rt 11 intersection to 11/250 in the downtown area. The road is commonly known as North Augusta Street and prior to this, Lee Highway. Some major points on this road include Terry Court Shopping Center, St. John's United Methodist Church, United States Postal Service Staunton Office, Kings Daughter Rehabilation Center, Staunton Public Library, and Staunton's Downtown District. U.S. Route 11 Bypass (US 11 Byp.) was a bypass of the section of US 11 between Camp Hill and Wormleysburg in Pennsylvania, bypassing Lemoyne. The route began at an intersection with US 11 (Market Street) and the eastern terminus of PA 641 (32nd Street) in Camp Hill, heading north on multilane 32nd Street. The road curved east and became Cumberland Boulevard, heading into Wormleysburg. Here, US 11 Byp. became Walnut Street and headed northeast, crossing a Pennsylvania Railroad line and coming to its terminus at an intersection with US 11/US 15 (Front Street) on the west bank of the Susquehanna River. US 11 Byp. was first designated in the 1930s. At this time, the route began at US 11/PA 641 in Camp Hill and headed north and east to Wormleysburg, where it intersected PA 14 at Front Street and headed southeast concurrent with that route on Front Street to end at US 11/US 15 at the west end of the Walnut Street Bridge over the Susquehanna River to Harrisburg. In 1941, the eastern terminus of the bypass route was cut back to Wormleysburg after US 11/US 15 were realigned to replace PA 14 on Front Street. In the 1940s, US 11 Byp. was replaced with mainline US 11, with the former alignment of US 11 between Camp Hill and Wormleysburg designated as US 11 Alt. U.S. Route 11 Alternate (US 11 Alt.) was an alternate route of US 11 between Camp Hill and Wormleysburg in Pennsylvania, passing through Lemoyne. US 11 Alt. began at US 11/US 15 at the intersection of 32nd and Market Streets in Camp Hill, heading east along Market Street. The route continued into Lemoyne and curved to the northeast, intersecting US 111 at 3rd Street. At this point, US 11 Alt. became concurrent with US 111 and the two routes continued northeast along Market Street, crossing a Pennsylvania Railroad line as the road curved northwest to follow the west bank of the Susquehanna River. US 11 Alt./US 111 became Front Street and passed the western ends of the Market Street Bridge and the Walnut Street Bridge, which both cross the river to Harrisburg. The alternate route continued along the west bank of the Susquehanna River into Wormleysburg, where it and US 111 both ended at an intersection with US 11/US 15 at Walnut Street, where Front Street continued north as US 11/US 15. With the creation of the U.S. Highway System in 1926, Market Street through Camp Hill and Lemoyne was designated as part of US 11/PA 13, which crossed the Susquehanna River into Harrisburg on the Market Street Bridge. US 15 ran concurrent with US 11 on Market Street in Lemoyne east of State Street while US 111/PA 4 was concurrent east of 3rd Street in Lemoyne. In 1928, PA 5 was designated onto Front Street in Lemoyne and Wormleysburg while the PA 13 and PA 4 designations were decommissioned along Market Street. In the 1930s, PA 14 replaced the PA 5 designation along Front Street. US 11/US 15 were realigned to run along Front Street in 1941, replacing PA 14. In the 1940s, US 11 was shifted to bypass Lemoyne to the northwest, replacing US 11 Byp., while US 11 Alt. was designated onto the former alignment of US 11 between Camp Hill and Wormleysburg, running concurrent with US 15 between State Street in Lemoyne and Wormleysburg. US 15 was realigned to the west in the 1950s, following US 11 along the bypass, with US 111 extended north along US 11 Alt. to end at US 11/US 15 in Wormleysburg. US 11 Alt. was decommissioned in the 1960s, with the former alignment becoming unnumbered. ^ a b Google (November 5, 2017). "US 11 Bypass/Keith Street" (Map). Google Maps. Google. Retrieved November 5, 2017. ^ Tennessee Department of Transportation (2015). Official Transportation Map (PDF) (Map) (2015–16 ed.). c. 1:633,600. Nashville: Tennessee Department of Transportation. § E11. Retrieved November 5, 2017. ^ a b Kaylor, Greg (January 26, 2007). "A hundred years ago in Cleveland". Cleveland Life. Cleveland, Tennessee. ^ Google (February 24, 2013). "US 11/19 Truck - Bristol, Virginia" (Map). Google Maps. Google. Retrieved February 24, 2013. ^ a b c "Daily Traffic Volume Estimates Jurisdiction Report: Rockbridge County" (PDF). Virginia Department of Transportation. 2015. Retrieved 6 March 2017. ^ State Highway and Transportation Commission (April 15, 1982). Minutes of Meeting (PDF) (Report). Richmond, VA: Commonwealth of Virginia. p. 12. 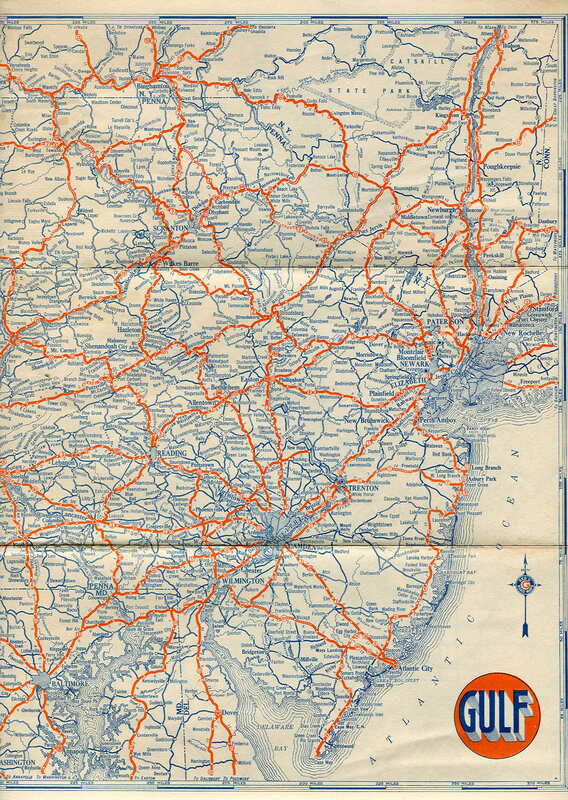 ^ a b c General Highway Map Cumberland County, Pennsylvania (PDF) (Map). Pennsylvania Department of Highways. 1941. Retrieved February 15, 2016. 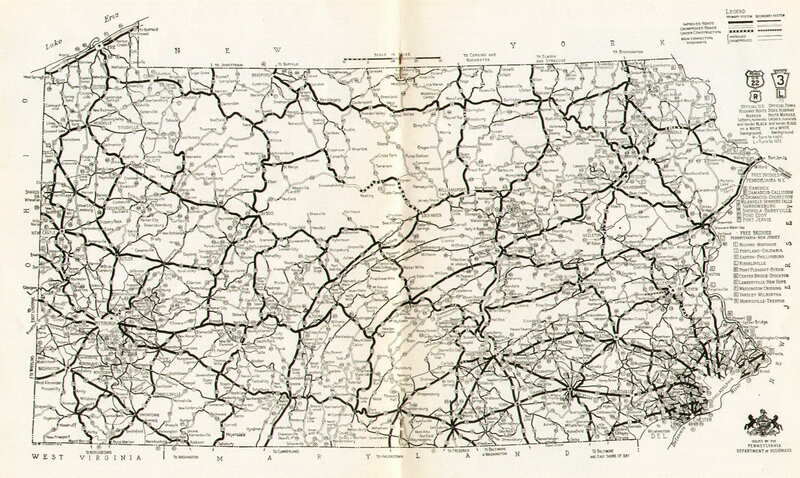 ^ Official Road Map of Pennsylvania (PDF) (Map). Pennsylvania Department of Highways. 1940. Retrieved June 24, 2010. ^ a b Official Road Map of Pennsylvania (back) (PDF) (Map). Pennsylvania Department of Highways. 1940. Retrieved January 1, 2014. ^ a b "Local Road Route Changes Affect Harrisburg Drivers". The Evening News. Harrisburg, PA. June 20, 1941. p. 18. Retrieved August 14, 2015 – via Newspapers.com. ^ a b General Highway Map Cumberland County, Pennsylvania Sheet 1 (PDF) (Map). Pennsylvania Department of Highways. 1956. Retrieved February 15, 2016. ^ Pennsylvania Highway Map (eastern side) (Map). Gulf Oil. 1926. Retrieved December 26, 2007. ^ Tourist Map of Pennsylvania (PDF) (Map). Pennsylvania Department of Highways. 1930. Retrieved December 16, 2014. 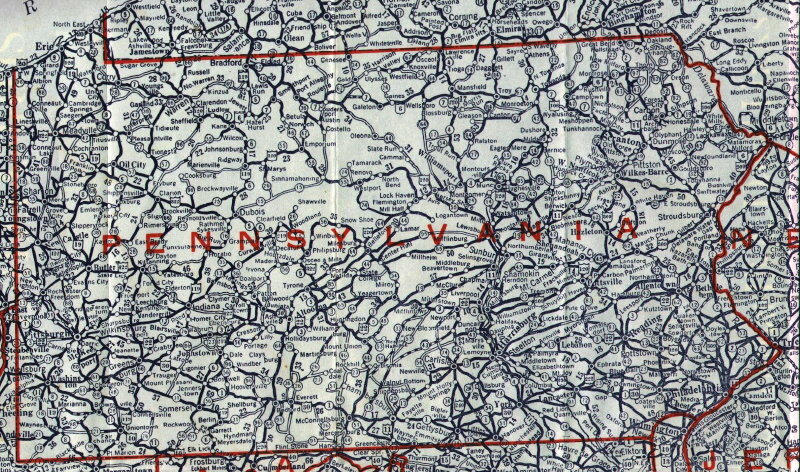 ^ Official Map of Pennsylvania (back) (PDF) (Map). Pennsylvania Department of Highways. 1970. Retrieved December 16, 2014. This page was last edited on 13 February 2019, at 02:45 (UTC).